Ultrafast, high-power lasers produce very short pulses, as short as one tenth of one millionth of one million of a second. At the speed of light, this time corresponds to the thickness of a hair! Due to this very short duration, these lasers concentrate their energy into a very high power, that allow very spectacular applications. Among these applications, one can mention the influence of lasers on high-voltage discharges. Recently, it was shown that an adequate choice of the light phase across the laser beam (known as «Airy beams») allow to generate curved self-guided filaments of light . Furthermore, these curved light filaments can self-heal if they hit an obstacle. They are also ionized, hence electrically conducting. Based on these properties, researchers from several groups around the world demonstrated the possibility to guide discharges over a curved path, and to circumvent an obstacle, as shown in the picture below . Laser-guided electrical discharge jumping around an isolating obstacle. Credit: Clerici, M., Hu, Y., Lassonde, P., Milián, C., Couairon, A., Christodoulides, D., Chen, Z., Razzari, L., Vidal, F., Légaré, F., Faccio, D. F. A. & Morandotti, R. 19 Jun 2015 In : Science Advances. 1, 5, e1400111. Depending on the voltage conditions, lasers can also prevent electrical spark discharges, by unloading high-voltages in a smooth way. By spreading charges around high-voltage electrodes loaded under tens to hundreds of kV, the laser filaments distort the electrical field and allow a diffuse flow of the electrons. In adequate configurations, this electron flow cannot concentrate into channels of strong current that constitute a step towards the spark discharges. In that regard, the elongated shape and the thin diameter (100 µm, for a length of tens of cm to tens of m) of the laser filaments is essential as it offers no privileged location for the discharges start, or attachment. This effect is so efficient that it can even be obtained with the laser placed away from the electrodes. It offers new prospects for fast switching of high-voltage lines. 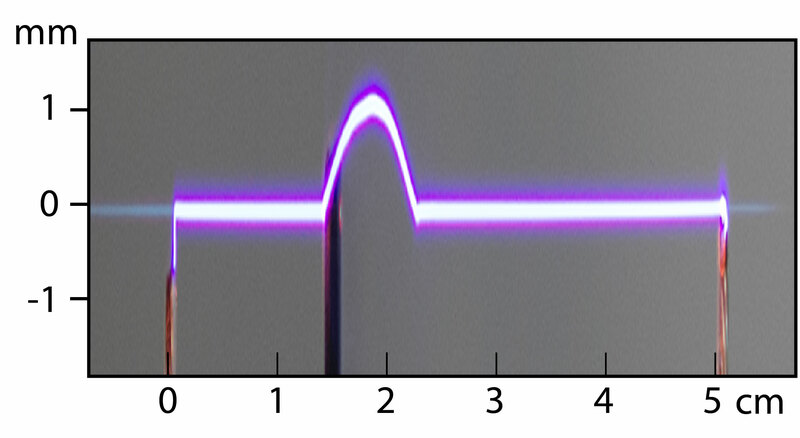 Remote electrical arc suppression by laser filamentation. Credit: . Another spectacular effect of ultrashort laser pulses in the atmosphere is their influence on particle condensation. The laser injects electric charges in the atmosphere and that triggers chemical reactions of the air components. The resulting products are hygroscopic, i.e., they like to mix with water. The charges and hygroscopic compounds produced by the laser favor the condensation of new particles in the air, and their subsequent growth up to sizes of a few micrometers . Current research aims at better understanding the phenomenon at the molecular level  and at defining the most efficient lasers in that purpose. Laser-induced condensation. 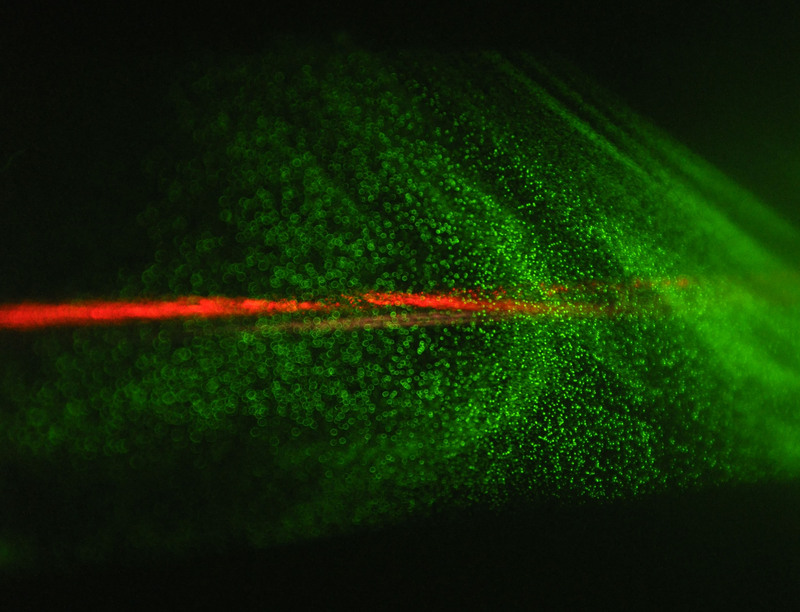 The ultrashort laser (in red) produces a cloud of new particles that is illumined by a second, auxiliary laser (in green). Credit: J. Kasparian. In parallel, in colder conditions, the resulting particles can grow as ice crystals,  or as ice flakes . Due to the high temperature variations in these experiments, the laser can heat the air sufficiently to induce convection and convective air motions, that further support the growth of the particles by redistributing the water vapor. Turbulence induced in a cloud chamber by filaments in ultrashort laser pulses. Credit: J. Ju, H. Sun, A. Sridharan, T.-J. Wang, C. Wang, J. Liu, R. Li, Z. Xu, S.L. Chin,” Laser-filament-induced snow formation in a subsaturated zone in a cloud chamber: Experimental and theoretical study”, Phys. Rev. E 88, 062803 (2013). Laser-induced condensation is currently limited to the small volume illuminated by the laser, and does not at present allow the particles to grow to the size in the millimeter range, that allows water droplets to fall down as rain. However, these particles may provide seeds that could further grow naturally, in adequate atmospheric conditions. Furthermore, the triggering of particle formation and its subsequent sounding by a second laser could be used as a test to characterize the possibility of condensing precipitation in a given air mass . 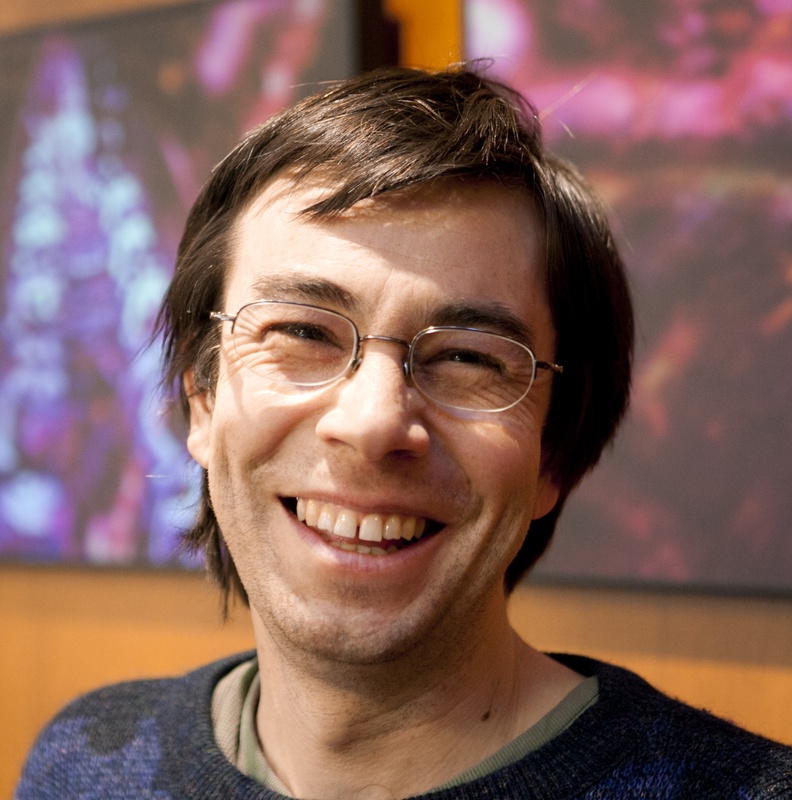 Jérôme Kasparian is professor of Physics at the University of Geneva. He specializes in analogies between non-linera physical systems, as well as in the atmospheric applications of ultrashort laser pulses. In particular, he has been coordinating the French-German-Swiss project Teramobile that conceived and operated the first ultrafast laser suitable for field experiments.